As you know I was a Military Chaplain for many years. 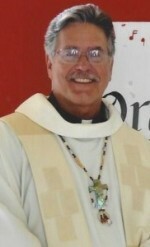 I returned to the Diocese to parish Ministry in 2003. Until then the acronym ‘A.M.A.’ meant one of four things to me: American Medical Association, American Motorcyclist Association, American Music Awards or ‘Against Medical Advice’. I soon learned that it had a fourth; Annual Ministry Appeal. Something you are very familiar with. Looking at past records I see that we have been very generous and timely in your response to this appeal. Rosa – which is a part of the Archdiocese of San Francisco and on and up all the way to The Vatican. on the individual parishes to fund the various programs that serve the Diocese as a whole. So, how are these monies collected and amounts determined? Each parish is assessed a figure based on previous years ‘plate’ (money you put in the basket on Sundays) contributions. This year our portion towards the A.M.A. is $ 34,456. (If by chance we exceed our goal then 100% of that excess comes right back to us). I have looked into this in comparison to the assessment of all the other parishes and can say that this is a fair and just valuation. CONTRIBUTION MUST HAVE OUR NAME – HOLY SPIRIT PARISH ON IT – so that we get the credit towards our goal. At this point we need to raise $11,767. to make our minimal goal. I’d like us to get to the 100% if possible. This means raising an additional $23,055. I know we can do this. Some of you have already received an A.M.A. mailing. We have about 600 households registered in our parish. As of this writing, 48 households have contributed. Many of you are new here this year so did not receive a mailing. To facilitate the process there will be an ‘in-pew’ solicitation soon at all the masses. Envelopes and pencils will be handed out and you can take a few moments to write your contribution amount and how you will provide it [Check, Money Order, Cash, Credit Card, etc.]. The envelopes are self-explanatory. I prefer that you drop them in our collection baskets or at the parish office. But, if you have already contributed via mail – there is no need to fill out another one. We will collect the envelopes at the end of Mass – and send them all together, or you can bring it to the next Mass you attend here. Either way it is imperative that they know you are sending it from this parish so we get full credit towards our goal. If you choose to mail it, please ensure you have our parish name on it (Holy Spirit Parish) so that we will receive full-credit towards our goal. Okay? It is up to you how you want to contribute to the A.M.A. ; either to the general fund – or – just one or a few Ministries. Please make a note with your donation. Although all ministries are worthy and in need. Please find below a list of the ministries that benefit from the A.M.A. Several of which relate specifically to the people of Holy Spirit. I have always encouraged you to take ownership of this parish. In this way you can extend that same sense to your Diocese. You are encouraged to donate in ‘general’ but, if there is or are particular ministries that you would like to support, please indicate that in writing and they will try to accommodate you. Tribunal, Vocations, Youth/Young Adult Ministry. Note: Not one cent of monies collected thought the A.M.A. goes towards any legal or settlement fees. They ONLY go to the ministries you will see mentioned above. Just so you know I have personally pledged $200.00 and have already kicked in $100.00. So – only $117,677 [minimally] more to go! My hope is that with each household giving what they can, 100% participation can be a reality. Together – we can do this! God bless you, our parish and our diocese.